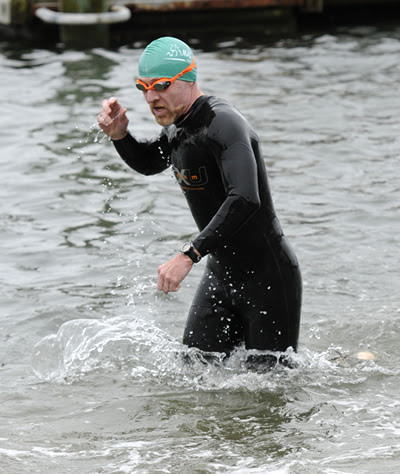 Webb: Well it finally arrived: the first triathlon of the season. We selected Max Performance's Escape The Cape sprint triathlon to be our season-opener. The race is so named as it is in the quaint towns of Onset and Wareham, just off Cape Cod (a little over an hour outside of Boston). We have done this race every year - which now stands at four. Elle: Like Webb said, we've done this race every year since it started. It has a symbolic meaning to us in that way, and also because last year, when the weather was awful, and they had to cancel the swim due to dangerous ocean currents, I secured my first ever first place AG podium finish, which was freaking awesome. You can read all about it here. So the fact that I couldn't race this year stung. A lot. Webb: I set an aggressive goal for myself two years ago to race this course in under an hour. Last year the RD canceled the swim due to the weather. This year with some new speed in my run legs, I liked my chances. Of course, I needed the weather to cooperate in not turning the race into a duathlon again or wind-driven waves pushing me backwards (see 2011). Both of these were possible with Tropical Storm Andrea whipping up the east coast. It rained all day Friday and into the night. All of the meteorologists forecasted that the rains would end early and be replaced by winds gusting to 45mph. Great. Wind instead of rain. I'll take rain any day over wind. Thankfully the towns worked with our favorite race director to push the start time from 8:00AM to 10:30AM to allow TS Andrea more time to make her way through New England. By the time 9:30 rolled around, it was overcast, breezy and basically pleasant. No rain. No gusting winds. And the water looked basically flat. Operation Under One Hour was on! Except that it wasn't. TS Andrea had done her damage the night before. The RD had to shorten the bike course due to road damage and unsafe levels of sand in the roadway. I was disappointed to a point. Nothing says high-speed crash with subsequent infected road rash quite like sand. It was the right decision. During the 1/3 mile walk down to the swim start, I chatted with a MA-native, NYC resident. He was a super nice guy and good athlete so it helped me not to think too much about my goal. Quite frankly the only strategy was to go hard until I crossed the finish line. If I thought too much about it, I was going to psych myself out. Thankfully it was a wet start. For many of you a 65F water temp is not so cold. For me, it is horrifying, even in a wetsuit. I waded out in the water and swam head up to the starting point. I know you are supposed to put your head in the water to acclimate, but I just could not do it. It was soooooo cold. After not very long the air horn sent us on our way. Even though the plan was to go hard, I was not going to go hard on the swim. First, I have been a negligent swimmer this season. Second, when I have swam I have noticed a correlation between increased effort and slower speeds. I needed to focus more on technique and efficiency. And third, I needed to swim straight. The two prior swims at this race I have found myself drifting out towards the bay to the right. My remedy this time was to repeat constantly to myself, "swim to the left, swim to the left." I did that and found as many feet to swim behind as possible. The result was a full minute faster swim than my best time at Escape The Cape. I was off to a good start. T1: Have I done this before? its debut on Webb's head. Webb: A seasoned triathlete is not immune to becoming cocky about the little things. Standing there dripping at my bike, I was confused. I fumbled around, dropped my helmet three times and generally wasn't sure with anything I did. Listen veterans! Do yourself a favor and run through your routine before your first race of the season. I was surprised that my T1 was not slower, and yet, I know that I could have been :10-30 faster if I had taken the time to rehearse. Elle: I had a lot of time to kill, so I went to the local breakfast place and had some eggs. It was tough watching all the athletes go by, doing their pre-race run/bike. We had parked a bit down the road, so after breakfast I decided to drop off the excess race bag stuff in the car. When I got there, I was just so tired that I reclined in the passenger seat and before I knew it, I had taken a serious, 30-minute nap. By the time I woke up I realized that I had missed the swim, and that Webb would be coming by soon on the bike. I jumped up and ran out to the road to cheer him on. The bike leg is normally a 10-mile out and back. As I mentioned above, thanks to TS Andrea the road conditions were unsafe. Luckily the damage was at the turnaround point so we only lost 1.25 miles. 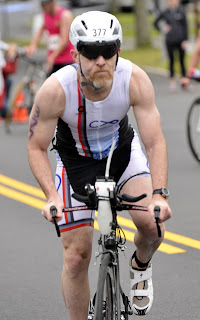 Once I was done fumbling about in T1 and had my bike in hand, I was anxious to ride hard. I hopped on the bike and fumbled around some more clipping my shoes into the pedals. Focus. Focus. Focus. Locked onto my bike, I charged up the short hill that starts off the bike. Down the back side I started to crank away and get some speed going. Pretty soon thereafter a guy passed me easily on the left. Up ahead I placed someone in my sights and worked to reel him in. I was working really hard and was having a hell of time catching him. It was driving me nuts. I could hear his bike making this whining sound and thought to myself, "This guy is out here on a bike in serious need of a tune-up and I can't catch him?" My legs were rapidly becoming fatigued. And that whining sound from that guy's bike. Utter madness! Focus. Focus. Focus. "Wait! Could it be my bike? Might it be a brake?" I stopped and checked the front wheel. Sure enough, my front brake was off-center and rubbing against my wheel. A quick re-centering and I was back on the bike. I put the brake debacle behind and began making up time. Eventually I found myself riding around (i.e., passing, being passed by) the same group of guys. We were making good time but it lacked organization and became quite frustrating. Obviously drafting is not permissible. However, you can work together by the lead rider setting a pace. The following rider then overtakes the lead rider when he or she begins to let up. It is about forcing each other through peer pressure to keep the pace up, not using someone's slipstream. The wrong way to do it is to surge ahead once you realize that you are being passed only to slow down again once you are back in front. If you are being competitive and can surge ahead and maintain the separation, then do it! You are in race after all. If you surge ahead simply because you can't stomach being passed or are trying to force the other rider into a penalty, then you are just being rude. Surge if you can maintain it, otherwise take the opportunity to work with someone. I came into T2 with an acceptable time. I would have like to have gone a bit faster, but hey, it is the first race of the season and my focus has been on the run all fall and winter. It was time to put it to the test. T2: Helmet off, shoes on. T2 went much better than T1. I gave myself one second to ask, "Helmet off, shoes on. That's it?" Yep, that's it. Time to run. Webb: Running out T2 I noticed something odd: I couldn't feel my toes or the balls of my feet. Hmmm. I I was pretty sure I was running. Feel it? Not really. It turns out that I rely quite a bit on feeling my foot drive through the road. I would guess it was a good mile or so into the run leg when feeling began to return to my feet. When it did, the feeling was mostly pain. You know the pins-and-needles type? Ugh. Anyway, thanks to muscle memory I'm pretty sure it did not actually slow me down. Unfortunately, I just don't think I had it that day. I ran hard and even tried to push harder into that extra gear that was there - just not presently available. For some reason, I just couldn't get to it. As I crossed the finish line I felt smashed, but not my usual "Is an EMT handy? "- smashed. I suppose I could have run another mile or more at that pace. I should have run faster and felt worse. 2. When taking the bike off the car rack, give it a once-over to make sure all is working order, <ahem> including the brakes. 3. Pedal with your legs, not your feet, lest they go numb on the run. Elle: Watching a race that I've always competed in was an interesting experience. The only woman to pass me on the run last year (an elite) was clearly there to settle a score this year. Remember her? I saw Kim readily passing men today, looking fresh as they looked like they were on death's door. I also saw Kyle Damon run by, team director of TEAM Water.org. We've been involved and are members of the team ever since we saw Running the Sahara, a movie I can't recommend enough. And today Webb was sporting the TEAM Water.org triathlon kit. When I saw Kyle run by, I shouted out, "Go Water.org!!! ", and even in his exhausted state, Kyle clearly was happy to hear the support. A short time later, Webb came by, looking great, as always, but said to me, "I'm dying a little...". Yup, that's about right. I made my way to the finish line, and who do I see but our good friend Beth Allen (who took first in her age group that day). And there were other triathletes there who we knew, it's kind of a smallish community and it's always nice to see familiar faces. It's one of the fun parts of racing - seeing old friends, meeting new ones. Oy, that sounds really cheesy. Anyhoo, the weather turned sunny and nice and it ended up being a beautiful day. Webb chatted more w/ Kyle (who finished 4th in his AG) and Bill (also from Team Water.org, who won his AG!). It was a good day - sad that I had to sit this one out, but I'll live to race another day.